This exclusive Signature Style Personalized Coffee Mug comes in 11 oz. or 15 oz. sizes and is an excellent last minute Christmas gift for anyone on your list. A custom mug is one of those ingenuous gifts that can work for practically anyone—a family member, close friend, coworker, teacher, next-door neighbor—you name it. What makes an ordinary mug extraordinary is how you customize it. And the Signature Style personalized coffee mug makes this easy and elegant. Simply add any name and select the colors you like and the unique design is created for you. The Signature Style personalized coffee mug comes in the standard 11 oz. or the larger 15 oz. size options. You can customize each mug by first selecting the color of the inside of the mug and the matching mug handle. The Signature Style design is printed on a white background and you can choose the two colors that the text will appear in from 12 color options. 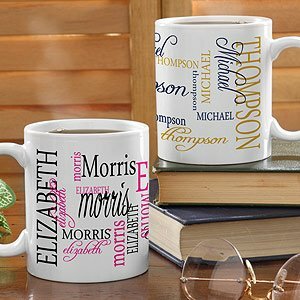 Finally, you can personalize each mug with the person’s first name, first and middle name, first and last name or even a nickname! The personalization is completely up to you and that’s how each custom coffee mug ends up looking completely unique. The Signature Style design is also available on travel mugs, stainless steel water bottles and more. Classic shape ceramic coffee mug available in 11 oz. and 15 oz. size options. Choose from 5 mug color options and a combination of 2 text colors. Add up to two lines of text with up to 12 characters each. Easy to create and perfect for anyone, the Signature Style personalized coffee mug can be a standalone gift or part of a lovely holiday gift basket. You can even fill it with candy, cookies, specialty coffee, hot cocoa or tea for that special touch.